Need help relaxing so you can fall asleep quickly? 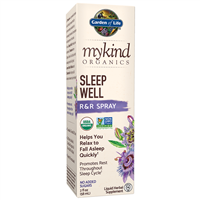 The ingredients in mykind Organics Sleep Well are designed to do just that. L-Theanine is a powerful amino acid clinically researched to promote deep relaxation by increasing the levels of serotonin and dopamine in the brain. We’ve combined L-Theanine from Organic Green Tea Extract with relaxing herbs like Organic Lemon Balm, Hibiscus and Chamomile to help you fall asleep and awake feeling refreshed.